iAngler won the pitch to recreate Korda’s online web presence a couple of years back. The brief was basically to create the best fishing website online, with a focus on interactive content so the customers kept coming back for more. 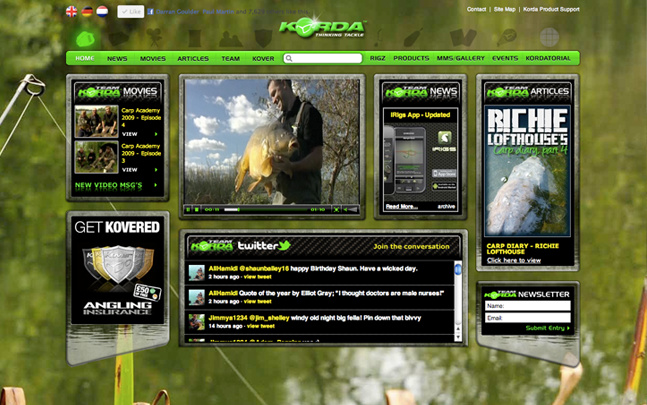 Korda has since won the Carp Talk “Best Fishing Website” prize in 2010. Through use of online articles, video diaries and exclusive news stories from the whole of the Korda Team, there is every reason to revisit the website every day. There is a wealth of Carp Fishing information constantly updated on the hub which will keep you entertained for literally hours on end. If that wasn’t enough, you can also text though your catch pictures from your mobile phone, and appear on the specific MMS Gallery section, and even tweet your favourite anglers via the newly added twitter feed on the site. We have also translated the Website for its German, and Dutch base. All of the content can be updated manually via the bespoke CMS system running in the background.